Trump Administration On Verge Of Restoring Iran Sanctions After Leaving Deal The Trump administration says penalties will snap back into place overnight against several sectors of the Iranian economy, embarking on a multistep return to U.S. policy before the 2015 nuclear deal. 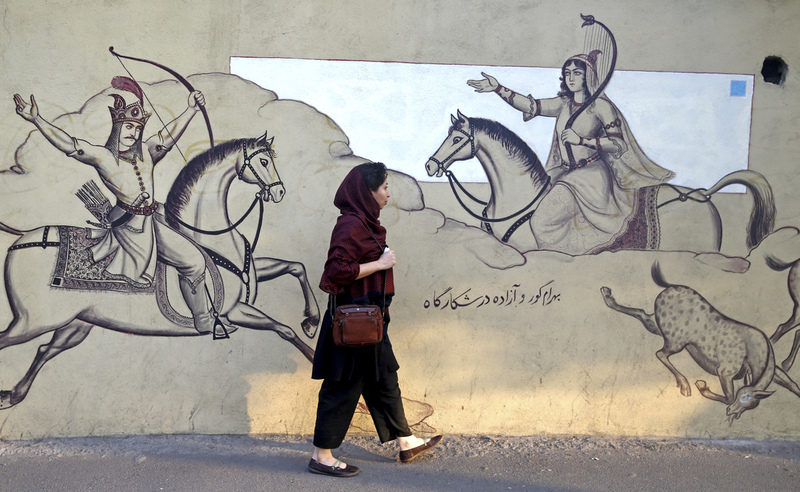 An Iranian woman walks past a wall mural last month in downtown Tehran, Iran. The White House says that overnight, it will reinstitute regulations that, among other things, prohibit the Iranian government's use of U.S. dollars and erect barriers to trade with Iran involving aluminum and steel, the Iranian automotive and airline industries, and gold and other precious minerals. It will be an additional 90 days before the rest of the sanctions "snap back" into place in early November. This includes the sanctions that are expected to carry more weight — including bans on doing business with Iran's Central Bank and accepting the country's crude oil exports. In a statement released Monday, President Trump cast the move to restore sanctions as a means of rectifying what it says is the Obama administration's mistake in agreeing to the Joint Comprehensive Plan of Action, or JCPOA. That accord — negotiated also with the U.K., France, German, Russia and China — suspended U.S. sanctions in return for limits and regular inspections on Iran's nuclear programs, while allowing the country to continue enriching uranium for peaceful energy purposes. On Monday, Trump called the pact a "horrible, one-sided deal" that failed to block Iran's nuclear aspirations and "threw a lifeline of cash to a murderous dictatorship that has continued to spread bloodshed, violence, and chaos." "To this day," Trump added, "Iran threatens the United States and our allies, undermines the international financial system, and supports terrorism and militant proxies around the world." The move, which follows through on Trump's May 8 vow to unilaterally withdraw from the multinational nuclear agreement, cheered Israeli Prime Minister Benjamin Netanyahu and members of the president's party, who had long railed against the deal. Shortly after it was negotiated, Republicans in Congress tried, and narrowly failed, to pass a resolution formally disapproving of the executive agreement. Since then withdrawing from the deal has become a centerpiece of GOP campaigns, including Trump's presidential run in 2016. Outside U.S. borders, however, the Trump administration's decision to snap sanctions back into place has been received with a mixture of regret, anger and alarm — especially among the other countries that engaged in the deal, and that have promised to stick with it despite the U.S. decision to renege on its commitment. "The JCPOA is working and delivering on its goal, namely to ensure that the Iranian programme remains exclusively peaceful, as confirmed by the International Atomic Energy Agency (IAEA) in 11 consecutive reports," representatives for the European Union, France, the U.K. and Germany said in a joint statement on Monday. "It is a key element of the global nuclear non-proliferation architecture, crucial for the security of Europe, the region, and the entire world. We expect Iran to continue to fully implement all its nuclear commitments under the JCPOA." Earlier this year, two months before Trump's withdrawal announcement. IAEA Director General Yukiya Amano reaffirmed that Iran "is implementing its nuclear-related commitments," adding that if the 2015 deal were to fail, "it would be a great loss for nuclear verification and for multilateralism." That's a sentiment echoed in Monday's joint statement by the European ministers, who put the matter only a bit differently: "Preserving the nuclear deal with Iran is a matter of respecting international agreements and a matter of international security." The EU announced that its "blocking statute" — aimed at "sustaining trade and economic relations between the EU and Iran" in the face of renewed U.S. sanctions — will enter into force on the same day as the restored sanctions. Still, despite the concerns voiced by the United States' erstwhile negotiating partners, Trump administration officials say their goal, too, is to reach a peaceful agreement with Tehran, albeit this time on more favorable terms for Washington. Or as Secretary of State Mike Pompeo put it Sunday, the prospect of sanctions relief would "require enormous change" from Iran's leadership. "The president has been very clear none of this needs to happen," a senior administration official said Monday on a background call with reporters. "He will meet with the Iranian leadership at any time to discuss a real comprehensive deal that will contain their regional ambitions, will end their malign behavior, and deny them any path to a nuclear weapon. The Iranian people should not suffer because of their regime's hegemonic regional ambitions." To this point, however, Tehran has been unimpressed with such overtures. The Trump administration "wants the world to believe it's concerned about the Iranian people. Yet the very first sanctions it reimposed have canceled licenses for sales of 200+ passenger jets under absurd pretexts, endangering ordinary Iranians," the country's foreign minister, Javad Zarif, tweeted Monday. "US hypocrisy knows no bounds." Iranian President Hassan Rouhani, for his part, offered a blunter assessment in a televised address Monday responding to the restored sanctions: "If you stab someone with a knife and then you say you want talks, then the first thing you have to do is remove the knife," he said, according to Reuters. "We are always in favor of diplomacy and talks ... But talks need honesty," he added. "Trump's call for direct talks is only for domestic consumption in America ahead of elections ... and to create chaos in Iran."